Killyclogher sharpshooter Mark Bradley hit 0-06 at the weekend. It was a case of deja vu at Carrickmore on Saturday as Killyclogher turned on the second half style to ease past Errigal Ciaran 12 months after a similar result at the same venue in the opening round of last season’s senior championship. If anything though this was even more impressive as they recovered from four points down to dominate the second half, outscoring their opponents 2-11 to 0-2. 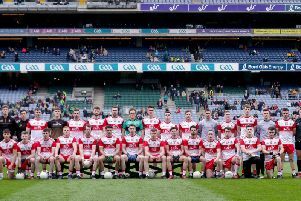 The sides shared the opening eight points with Mark Bradley, Conall McCann, Simon O’Neill, Davy Harte, Peter Harte and Declan Quinn getting points for their respective sides. As the interval approached Mark Kavanagh, Padraig McGirr, Peter Harte and Davy Harte all weighed in with quality scores to leave the Dunmoyle based men leading 0-9 to 0-5 at the break. Scores from Conall McCann, Bradley and Aidy Kelly had Killyclogher level within nine minutes of the restart before a Bradley free two minutes later gave them a lead they were never to lose. O’Neill hit a brace of points before, in the 47th minute, he palmed the ball to the net from close range after fellow substitute Leo Meenan had squared it to him. Sixty seconds later it was game over when Feargal Meenagh shot low to the net after good approach play from the hard working Tiernan McCann. The winners had hit 2-7 without reply by the time Davy Harte opened Errigal Ciaran’s second half account in the 51st minute. Meenan, corner-back Martin Swift, Conall McCann and Bradley all tagged on points and while Peter Harte had the final say from a free it was well over at that stage as it finished 2-16 to 0-11. The St. Mary’s now face a repeat of last season’s County final against Trillick this weekend when they will hope to come out on top this time.